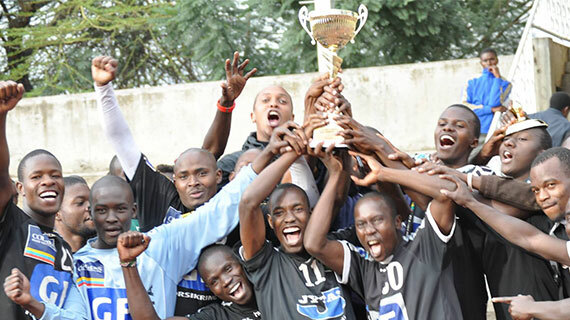 A journey that started in 2002 for Technical University of Kenya culminated in one of the biggest upsets in the history of Kenyan Handball when TUK dethroned Cereals Board of Kenya to clinch their maiden trophy to be crowned 2014 Champions at a tense match played at the Nyayo National Stadium hand court on Sunday Afternoon.TUK had upset another bigwig Ulinzi in the semi finals. Despite the chilly weather, the courtside atmosphere was boiling hot with the two teams facing off for the first time in a play Off finals. Against Cereals, TUK took an early lead maintaining a two gap lead and capitalizing on first breaks to cancel every Cereal goal. Cereals suffered a crucial blow midway the first half when they lost their first choice goal keeper Tirus Ochieng through a knee injury. The students never relented besieging the cereal goal with a barrage of shots leading by 6 goals by the half time whistle. 14-08. Cereals came back guns blazing in the second half managing to reduce the gap to four goals before TUK regained their tactical discipline to steady their ship amidst Cereals Storm. There was enough time for late drama when cereal switched to man to man defence forcing TUK into mistakes to narrow down the gap to 3 goals with 4 minutes on the clock. TUK put themselves under more pressure conceding a two minute foul and a red card before holding off the now charged Cereal to emerge winners 25-22.